This gives an overview of the steps taken in order to browse/search a new image/video collection. The image or video set will be called demoset. The steps taken are basically execution of programs. 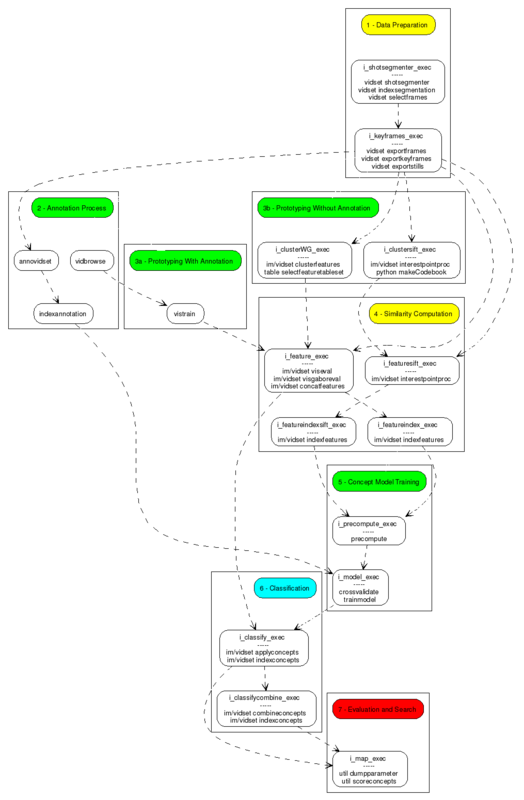 The structure of the programs are their command line options are described in Applications. At some points in the process we make use of annotations. The annotations typically originate from another data set called annoset. Naturally, demoset and annoset may designate the same data set. For clarity, we assume that each data set has its own subdirectory in a VisualSearch directory. So, we start with two directories : VisualSearch/demoset and VideoSearch/annoset. Annotation = (Label, shot | still | region | track) = (Label, Subject)? A108 - Export (key) frames. MakeThumbnails + + - - ? ExportStills def + + - - ? We assume that the raw video data is stored in (subdirectories of) VideoSearch/demoset/Videodata (from here on, we eliminate VideoSearch in path specifications). To define the set of videos to be processed we generate a text file with one line per video. The line is the path to the video file itself using the VideoData directory as root. The text file is stored in demoset/VideoData/demoset.txt. Within Impala, the text file is used via the Impala::Core::VideoSet::VideoSet class. Segments each video into a number of shots. The feature values used to decide upon the likelihood of a shot boundary are also stored. The --src lavcwriteidx option will generate an index file for each video to facilitate efficient and reliable random access to frame data in the future. An Impala::Core::VideoSet::ShotSegmenter object produces an Impala::Core::VideoSet::Mpeg7Doc and an Impala::Core::Table::SimilarityTableSet per video. The Mpeg7 documents are stored in MetaData/shots/. The shot boundary similarity scores are stored in SimilarityData/Frames/streamConcepts.txt/no_model/direct/. Produces an index for the shot segmentation from the Mpeg7 documents of all videos. An Impala::Core::VideoSet::IndexSegmentation object produces an Impala::Core::VideoSet::Segmentation (stored in VideoIndex/segmentation.tab), an Impala::Core::VideoSet::Keyframes (stored in VideoIndex/keyframes.tab) and Impala::Core::ImageSet::ImageSet 's for keyframes and thumbnails (stored in ImageData/keyframes.txt and ImageData/thumbnails.txt). The shot segmentation may be inspected using util dumpsegmentation demoset.txt and the keyframe definition using util dumpkeyframes demoset.txt . The keyframes are extracted from the videos for visualization purposes. It is most conveniant to store compressed jpg data of all keyframes in one archive per video. This is called a split archive. An Impala::Core::VideoSet::ExportKeyframes object does jpg compression on the frames and puts the data in a std::vector of Impala::Core::Array::Array2dScalarUInt8's. After each video Impala::Core::Array::WriteRawListVar writes the data to ImageArchive/keyframes/*/images.raw. The result may be inspected visually using show images.raw . Stills provide a more elaborate overview of a shot than (a) keyframe(s). From each shot a maximum of 16 images is taken with the constraint that they should be at least 15 frames apart. An Impala::Core::VideoSet::ExportStills object produces a Impala::Core::VideoSet::Stills (stored in VideoIndex/stills) and an Impala::Core::ImageSet::ImageSet (stored in ImageData/stills.txt). The still definition may be inspected using util dumpstills demoset.txt . Configured to store compressed jpg data of all stills in one archive per video. The --stepSize 10000000 implies that vidset actually skips all frames after providing the first one. The ExportStills object walks over the stills by itself because vidset has no knowledge of the stills. An Impala::Core::VideoSet::ExportStills object does jpg compression on the stills and puts the data in a std::vector of Impala::Core::Array::Array2dScalarUInt8's. After each video Impala::Core::Array::WriteRawListVar writes the data to ImageArchive/stills/*/images.raw. Export (key) frames as png images to allow for processing of frames without access to the video data. Uses png instead of jpg to avoid compression artefacts. An Impala::Core::VideoSet::ExportFrames object does png compression on the frames and puts the data in a std::vector of Impala::Core::Array::Array2dScalarUInt8's. After each video Impala::Core::Array::WriteRawListVar writes the data to Frames/*/images.raw. The result may be inspected visually using show images.raw --png . At the moment, we use two kinds of annotations: rectangular parts of consecutive frames for proto concepts and keyframes for high level concepts. Visual proto concepts are based on a set of annotations. Basically, an annotation is a rectangular part of consecutive frames in a video denoting what is visible within that rectangle. 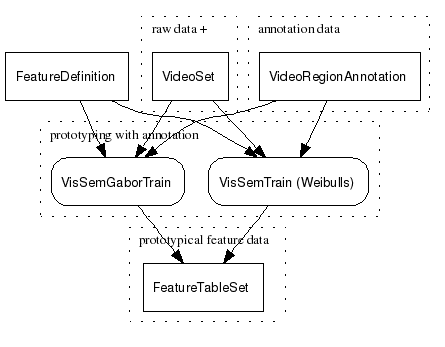 The vidbrowse application supports the video region annotation process. Jan has assembled an annotation set from the videos in the TRECVID 2005 development set. This annotation set (an Impala::Core::Table::TableVxs) is stored in VideoSearch/trec2005devel/Annotations/annotation.vxs. For training of high level concepts we use annotations of frames. Basically, such an annotation is a Label, i.e. a string, indicating that a concept, e.g. a car, is visible within the frames. The annotation does not provide any spatial information. The annovidset application support the frame annotation process. The set of Labels is defined by a plain text file and is stored in Annotations/concepts.txt. The annotations are stored as an Impala::Core::VideoSet::Mpeg7Doc per Label and per video in MetaData/annotations/concepts.txt/ . Indexes the Mpeg7 files into a set of AnnotationTables. 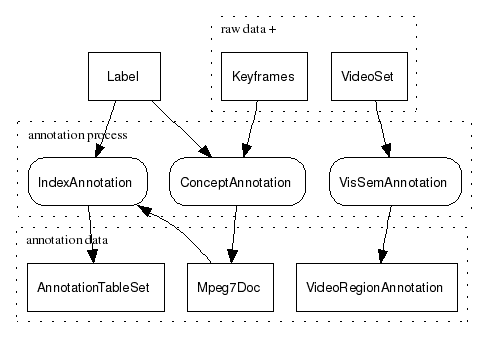 One AnnotationTable holds the annotations for one concept for all videos. The --segmentation option will map the annotations onto shots, i.e. a shot is positive in case it has an overlap with some positive annotation. The --keyframes option will map the annotations onto keyframes. An Impala::Core::VideoSet::IndexAnnotation object produces two Impala::Core::Table::AnnotationTableSet s. The keyframe table is written to Annotations/Frame/concepts.txt/*.tab and the shot table is written to Annotations/Shot/concepts.txt/*.tab. An individual Impala::Core::Table::AnnotationTable may be inspected using table dumpannotationtable Annotations/Frame/concepts.txt/concept.tab . 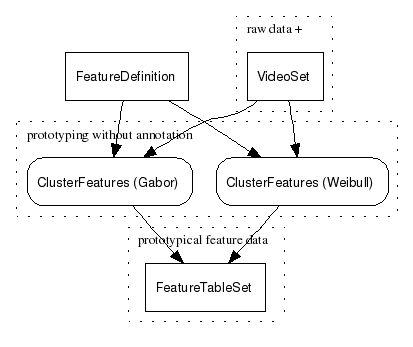 An overview of the annotations may be generated using table dumpannotationtableset annoset.txt concepts.txt Frame 0 . Compute prototypical features of each annotation to serve as a codebook. Computes prototypical Weibull features for each annotation. mainVidSet loads the annotations as bookmarks and gives each one to an Impala::Core::VideoSet::VisSemTrain object to process it. The result is an Impala::Core::Feature::FeatureTableSet with two Impala::Core::FeatureTable s (one for each scale : sigma=1.0 and sigma=3.0. Each table contains two Weibull parameters of six features (Wx, Wy, Wlx, Wly, Wllx, and Wlly) for all annotations. The tables are stored in Prototypes/annotation.vxs/vissem/ . This is very similar to A301 - Training of VisSem proto concepts using Weibulls except it uses Gabor features instead of Weibulls. An Impala::Core::VideoSet::VisSemGaborTrain object produces an Impala::Core::Feature::FeatureTableSet that is stored in Prototypes/annotation.vxs/vissemgabor/ . 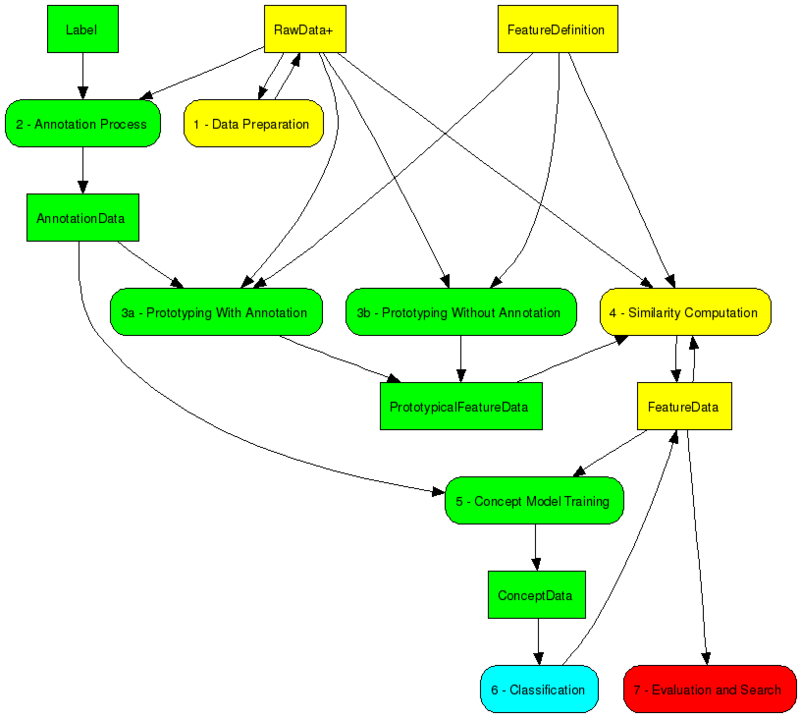 Compute prototypical features to serve as a codebook, typically using clustering. Computes prototypical Weibull features using radius based clustering. An Impala::Core::VideoSet::ClusterFeatures object with an Impala::Core::Feature::VisSem object is given each keyframe and uses an Impala::Core::Feature::Clusteror object to cluster the features. The result is an Impala::Core::Feature::FeatureTableSet with an Impala::Core::FeatureTable for each parameter setting. The tables are stored in Prototypes/clusters/vissem/ . This is very similar to A311 - Clustering of Weibulls except is uses Gabor features instead of Weibulls. The tables are stored in Prototypes/clusters/vissemgabor/ . Compute similarity of features from bulk data to prototypical features, e.g. features from annotated data. Typically, the bulk data comprises all keyframes in the video set. IndexFeatures + + - - ? Compute similarity of images/frames w.r.t. the visual proto concepts. An Impala::Core::VideoSet::ProtoSimilarityEval object with an Impala::Core::Feature::VisSem object is given each keyframe and computes its similarity to all proto concepts. First, the image is divided into a number of rectangles of varying size (size is defined by regions/dimension). For each of the rectangles features are computed and compared to the features of all annotations using a Weibull similarity function. The average similarity for all annotations of one concept is stored in an Impala::Core::Feature::FeatureTable as an intermediate result. The final result is computed by taking both average and maximum of the similarities for each combination of a sigma and a rectangle size. The result is an Impala::Core::Feature::FeatureTableSet with four Impala::Core::Feature::FeatureTable s: vissem_proto_annotation_scale_1_rpd_2, vissem_proto_annotation_scale_1_rpd_6, vissem_proto_annotation_scale_3_rpd_2, and vissem_proto_annotation_scale_3_rpd_6 (rpd stands for region/dimension). The feature vector of one of these tables typically contains 30 values : average and maximum similarity to 15 proto concepts. The tables are stored per video in FeatureData/Keyframes/vissem/vid.mpg/ . Concatenate feature vectors into one long vector. Such a vector typically contains 120 values. An Impala::Core::VideoSet::ConcatFeatures object is given each video id (the --keyframe and --virtualWalk option trick tell the Walker not to look for any actual data) to locate tables from an Impala::Core::Feature::FeatureTableSet and concatenate them into a single Impala::Core::Feature::FeatureTable. The result is stored in FeatureData/Keyframes/vissem/vid.mpg/ and may be inspected using table dumpfeaturetable vissem_proto_annotation_nrScales_2_nrRects_130.tab . This step is very similar to A401 - Compute vissem Weibull features for keyframes except for that it uses Gabor features instead of Weibulls. An Impala::Core::VideoSet::ProtoSimilarityEval object with an Impala::Core::Feature::VisSemGabor object produces an Impala::Core::Feature::FeatureTableSet. The tables are stored per video in FeatureData/Keyframes/vissemgabor/vid.mpg/ . An Impala::Core::VideoSet::ConcatFeatures object is given each video id (the --keyframe and --virtualWalk option trick tell the Walker not to look for any actual data) to locate tables from an Impala::Core::Feature::FeatureTableSet and concatenate them into a single Impala::Core::Feature::FeatureTable. The result is stored in FeatureData/Keyframes/vissemgabor/vid.mpg/ and may be inspected using table dumpfeaturetable vissemgabor_proto_annotation_nrScales_2_nrRects_130.tab . Concatenate the VisSem Weibull and Gabor feature vectors into a single vector. An Impala::Core::VideoSet::ConcatFeatures object is given each video id (the --keyframe and --virtualWalk option trick tell the Walker not to look for any actual data) to locate tables from an Impala::Core::Feature::FeatureTableSet and concatenate them into a single Impala::Core::Feature::FeatureTable. The result is stored in FeatureData/Keyframes/fusionvissemgabor/vid.mpg/ and may be inspected using table dumpfeaturetable fusionvissemgabor_proto_annotation_nrScales_2_nrRects_130.tab . Export features to an Mpeg7 file per video. An Impala::Core::VideoSet::ExportFeatures object transfers data from Impala::Core::Feature::FeatureTable s with the given Impala::Core::Feature::FeatureDefinition into an Impala::Core::VideoSet::Mpeg7Doc. The result is stored in MetaData/features/*.mpg/vissem.xml and MetaData/features/*.mpg/vissemgabor.xml. Create a single table with the given features of all videos in the set. An Impala::Core::VideoSet::IndexFeatures object assembles FeatureTables with the given Impala::Core::Feature::FeatureDefinition (stored per video) into one table. The result table is stored in FeatureIndex/vissem/, FeatureIndex/vissemgabor, and FeatureIndex/fusionvissemgabor. 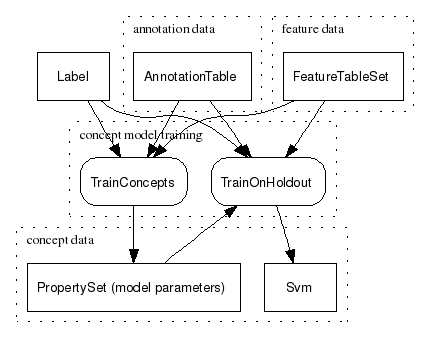 Train an (SVM-) model based on annotated feature vectors. Do a parameter search to find the optimal SVM model parameters for each feature set. Optimal parameters are determined using cross validation. Impala::Samples::mainTrainConcepts uses Impala::Core::Table::AnnotationTable s to assemble Impala::Core::Feature::FeatureTable s for positive and negative examples. An Impala::Core::Training::ParameterSearcher object produces an Impala::Util::PropertySet with the best model parameters. The result is stored in ConceptModels/concepts.txt/modelname/vissem/*.best. Use the best model parameters to train a model on the complete feature set. Also indicates how this model performs. Impala::Samples::mainTrainConcepts uses Impala::Core::Table::AnnotationTable s to assemble Impala::Core::Feature::FeatureTable s for positive and negative examples. An Impala::Core::Training::Svm object uses the best model parameters to compute an SVM model and stores it in ConceptModels/concepts.txt/modelname/vissem/*.model. The performance measure in stored in ConceptModels/concepts.txt/modelname/vissem/*.ScoreOnSelf. Compute a similarity score that indicates how well an object (frame, shot, etc.) fits a concept. Use concept classifiers to label features with a concept similarity. An Impala::Core::VideoSet::ApplyConcepts object creates an Impala::Core::Feature::ConceptSet with the given concepts. For each concept an Impala::Core::Training::Classifier is instantiated and asked to score all features in the Impala::Core::Feature::FeatureTable found for each video. The result is an Impala::Core::Table::SimilarityTableSet with concept similarities as well as a ranking per video. It is stored in SimilarityData/Keyframes/concepts.txt/modelname/vissem/vid.mpg/. Combine concept similarity scores of individual classifiers into one concept similarity score. An Impala::Core::VideoSet::CombineConcepts object loads an Impala::Core::Table::SimilarityTableSet for each feature definition. The scores in the SimTable's are averaged and ranked. The result is again a SimilarityTableSet and is stored in SimilarityData/Keyframes/concepts.txt/modelname/combnied/vid.mpg/. Export concept similarities to an Mpeg7 file per concept per video. An Impala::Core::VideoSet::ExportConcepts object transfers data from Impala::Core::Table::SimilarityTableSet with the given Impala::Core::Feature::FeatureDefinition into an Impala::Core::VideoSet::Mpeg7Doc. The result is stored in MetaData/similarities/concepts.txt/vid.mpg/concept.xml. Create a single table with the given similarity scores of all videos in the set. 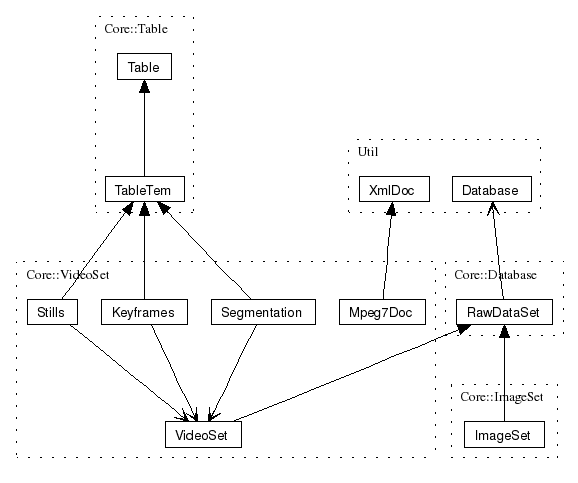 An Impala::Core::VideoSet::IndexConcepts object assembles Impala::Core::Table::SimilarityTableSet s related to the given Impala::Core::Feature::FeatureDefinition (stored per video) into one table. The resulting set of tables is stored in SimilarityIndex/concepts.txt/modelname/combined/concept_*.tab. Two ways to explore the results. A basic GUI to browse/check the results of most of the processing steps.